You’ve been preparing this meeting for months. You’ve got all your folders together: your research, your graphs, stats and script. You stride confidently into the office…trip and drop the whole lot on the floor. If only you’d had the right trolley to carry everything safely, you’d have saved the red face and hours of reorganising your papers. This is just one example of how useful the right trolley can be, but there are plenty of other ways a well-chosen trolley can make life easier. We’ve put together a selection of situations when an office trolley would come in handy and our top products for the job. If you need to transport folders or documents to other floors, departments or even buildings, a trolley is the best way to do it safely and with ease. Save time by just making one trip with all those files and papers rather than rushing back and forth for everything you need. Let the trolley do the hard work. Folders can be very heavy and you could easily injure yourself if you have to carry too many, too often. A trolley takes the strain and makes transport easy peasy. Stop juggling and eliminate the risk of dropping papers en route by keeping them neatly organised in a trolley. This office trolley is perfect for making light work of transporting documents and other small items around the workplace. It has two shelves, is easy to manoeuvre, has non-marking rubber tyres (stay in the caretaker’s good books) and the wire baskets are removable for the easy loading and unloading of documents. If you want to take papers, files and folders off-site to meetings or exhibitions, it’s essential to keep everything organised and together. A folding box trolley is ideal for these situations, providing a simple and convenient method of document transportation. It’s big, but not too big. You can fit plenty in it without making it too heavy to lift into the boot of a car. Place it compactly under an exhibition table or in your car. The telescopic handle packs away when not in use but extends to full length so you can simply wheel the trolley around. Carry it as a box if you don’t want to wheel it. Store it out of the way for the next exhibition. As the name suggests: it folds down flat when not in use. Inexpensive and lightweight, with a telescopic handle and rubber wheels, this folding trolley box is ideal for trade shows, exhibitions and meetings off-site. Keeping organised in the mailroom and when delivering mail around the office is often easier said than done. By using a dedicated mailroom trolley you will find it much easier to efficiently distribute letters and parcels. Save time by taking all the mail with you in one go as you journey around the office. Keep organised by loading up different baskets with the post for different departments. No more doubling back to Accounts because one of their letters slipped in with the parcels for Marketing. Save your back by simply wheeling parcels around rather than carrying them. This neat product is the ideal mailroom trolley. Its two large and one small removable wire mesh baskets keep post organised and visible. The swivel wheels are non-marking and make the trolley easy to manoeuvre, and there are four corner bumpers to save walls and doorframes if your steering skills are a bit dubious. Finally, a real bonus feature of this trolley is the fixed writing tray at the top. Use it to tick off departments as you go, or maybe work on your next novel while you’re waiting for the lift. Without regular cups of tea and coffee, it is likely that every office in the UK would descend into anarchy within days. Don’t risk it and invest in a tea trolley to keep your workforce hydrated, preferably offering the odd biscuit or two to sweeten the deal. Save time by transporting all the cups, sugar, milk and drinks in one go. Reduce the risk of burns by effortlessly wheeling hot drinks around. Forget sloshing coffee over yourself when juggling three steaming cups in each hand. Create a self-service drinks station for meetings by setting up your trolley with teabags, coffee, sugar and tea urns, and discreetly wheeling it into the boardroom when needed. Become the most popular member of the team. When your colleagues hear that tea-break trolley speeding their way, they’ll always have a big smile waiting especially for you. This trolley comes with either two or three shelves depending on how many biscuits you’re planning on loading it with. It’s easy to manoeuvre with two-wheel brakes for when you want to park your trolley safely. The stainless steel construction also means that it is easy to clean off any drips, spills or crumbs. If you think a trolley might be handy now and then but don’t want a specific trolley for each job around the office, a folding jack-of-all-trades trolley might be just the thing for you. This trolley folds flat in one simple move so can be stored away neatly and used whenever necessary. It features three shelves and four swivel castors, two of which are braked, and could be used to transport documents, distribute mail or any number of tasks around the office. 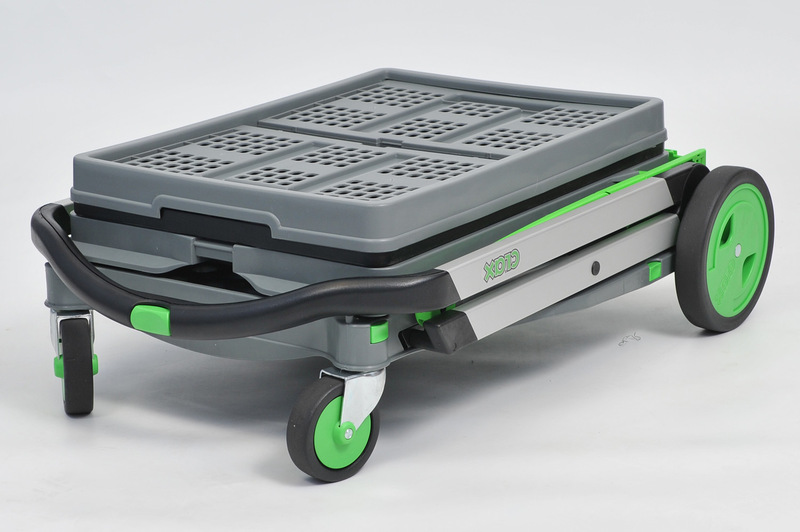 It won’t match up to a specially designed trolley for specific tasks but is great if you’re short on space or only have occasional demand for a trolley. There are plenty of opportunities to make life easier around the office with a well-designed trolley. Hopefully we’ve given you a few ideas to get started but feel free to browse our full selection of shelf trolleys here. Alternatively get in touch with our sales team who’ll be happy to help you choose the right trolley for the job. Call us on 0800 652 6000.